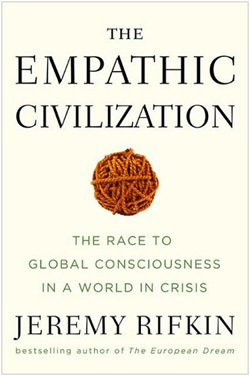 In the current global debate over technology displacement, automation, and the decline of employment, Rifkin is credited with being the first to raise the issue and lay the intellectual groundwork for both understanding the nature of the phenomenon and its far reaching implications for society. The End of Work has been translated into 19 languages. In the ensuing decade, the Collaborative Commons took flight, as millions of consumers became prosumers and began accessing and sharing information, knowledge, entertainment, renewable energy, 3D printed products, cars, homes, clothes, and other items on a vast global commons, ushering in a new economic paradigm. Rifkin’s prescient vision of an economy transitioning from ownership to access is often cited by the leading voices in the shareable economy as providing the intellectual foundation for the new economic model that’s transforming the way a younger generation engages in economic life. The Age of Access has been translated into 14 languages. In 2011, Jeremy Rifkin published the New York Times best seller The Third Industrial Revolution, which captured the attention of the world. Mr. Rifkin is a principle architect of the European Union’s Third Industrial Revolution long-term economic development plan. The Third Industrial Revolution has also been endorsed by the United Nations and embraced by world leaders including Chancellor Angela Merkel of Germany, President François Hollande of France, and Premier Li Keqiang of China. In December of 2013, subsequent to an official visit by Mr. Rifkin with Chinese leaders, China announced an $82 billion initial commitment to erect a green Energy Internet as the centerpiece of its long-term economic vision of becoming the world’s leading Third Industrial Revolution economy and post-carbon society. The Third Industrial Revolution was the best-selling economics book in China in 2012 and 2013, with 400,000 copies in print. Rifkin is the President of the TIR Consulting Group LLC which advises national governments, regions, and municipalities on developing Third Industrial Revolution Master Plans to transition their economies into a post-carbon society. The TIR Consulting Group LLC is composed of many of the world’s leading renewable energy companies, construction companies, architectural firms, real estate companies, IT companies, power and utility companies, and transport and logistics companies. The Third Industrial Revolution has been translated into 19 languages.